Welcome to our tropical paradise on a truly grand ½ acre property. Enjoy your new home away from home! This remarkable house has undergone a complete remodel with newly, tasteful furnishings. A fabulous, cozy and warm atmosphere with all the amenities you’ll need. Why stay in a hotel when you can be more comfortable in a luxurious, private home! 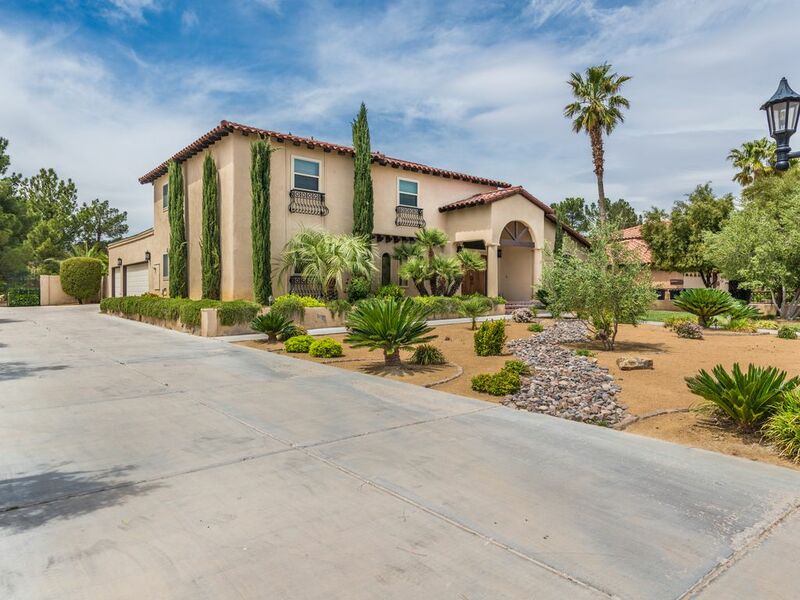 This home is centrally located in southwest Las Vegas only 4 miles from the Las Vegas Strip (short 6 minutes from Wynn Hotel & Casino) in a million dollar residential neighborhood. A spacious 2 story 4,000 sq. ft. home with 6 Bedrooms, 4 Baths and accommodates sleeping for up to 18 people. Indoors: feel free to lounge in the gaming room that includes a 42” TV, pool, and poker tables. The spacious family room also features a 55” TV with blackjack and craps tables for added entertainment. Bring all of your friends and family to enjoy this perfect entertaining house! Outdoors- our quiet, cozy and spacious ½ acre quiet backyard awaits you! Take a dip in the PRIVATE in ground pool/spa. Enjoy yourself on the putting green. Or simply relax under a covered, tiled patio and enjoy a meal prepared on the large, stainless steel gas grill. This is the perfect entertaining house! Great location. Large enough for our golf group. Enjoyed the poker table and pool table. Great house for guys golf trip. House was very clean and excellent amount of space for a group of 18 people. As long as all of the rules are followed then the property is perfect for large groups that don’t want to stay on the strip. Upon arrival, the next door neighbor was very rude in immediately threatening to call the police if we’re loud and don’t respect the neighbors. Mind you, this was at 2pm while 4 people were outside golfing. The attitude was off putting but we were aware of the rules laid out clearly by the owner Aside from that I enjoyed the property and would stay there again when returning to the strip. Vicki was very accommodating with flexible check in and check out times as well as providing the necessities within the house. The property was worn but just right for a long, holiday weekend stay. Overall busy was very enjoyable. The property manager Vicky was very accommodating I only hiccup was the teaching wasn't well stock. It was a beautiful and clean home. I will definitely recommend this home and coming back during my next visit. We had nine of us there for the SHOT Show. I worked out perfect with nine beds and plenty of room to cook. Clean bathrooms. The only thing that was missing was a tray in the showers to put your soap and shampoo. You had to set it on the floor? The property is in a nice location central to all Las Vegas activities. It was comfortable and accommodated our group of 19 well when we were all together. We only had 8 adults and 5 children actually sleep at the house but could have slept a few more. The house is in need of a few minor "up-keeping" type of repairs but nothing that was detrimental to our stay, just cosmetic issues. Vicki was pleasant to communicate with and check in was easy. I would recommend this property for large groups. The house worked out great for our group attending a convention. It was nice being off the strip and relaxing in the spa after being on our feet all day. Preparing breakfast and dinner in the spacious kitchen was great, but there were no spices or anything in the cabinets. I have rented several homes and this was the first time the basic cooking essentials were not there, just pots and pans. Stores are close by and we stocked up with everything that we needed. Everyone had their own bedroom and enjoyed their stay. I-15 off Sahara - Southwest Las Vegas (the best area in town), Nevada zip code 89117. Major cross streets are Rainbow and Desert Inn. 5.5 miles from Las Vegas Convention Center and 5 miles from Wynn Casino. Easy Access to I-15 & I-95 in a million dollars residential neighborhood. Closed to all the shopping malls, etc. 3 nights minimum,$400 Refundable security/damage deposit & reservation hold. $200 cleaning charge. Based upon 18 person occupancy. $15/nt add'l person. Full Amount Due within 30 Days of Beginning Booking Date. 5 Night Minimum Stay During Christmas and New Year Holidays Note: Until confirmed, rates are subject to change without notice.